Gerber daisies (Gerbera jamesonii), also called Transvaal daisies, are grown outdoors as tender perennials in U.S. Department of Agriculture Plant Hardiness Zone 8-11 which are located in the far south and west. Because we are in a cooler climate (Zone 6), they are considered annuals or houseplants here. I have always felt that due to the amount of effort involved to winterize Gerber daisies outdoors, they are not worth the trouble. Even bringing them inside for the winter requires a lot of preparation. Unfortunately in your case, it is too late in the season for them to survive and you pretty much are stuck with leaving the plant where it is and replacing it in the spring. We have had some major killing frosts already and you may see signs of frost damage on the daisy. In the future, if you want to winterize a Gerber daisy indoors, you need to start several weeks before the first frost (in late September). Dig up the plant from the garden and prune off remaining flowers. Then, remove most of the soil from the root ball and cut back some of the roots (not the tap root). Place the daisy into a new pot with fresh potting soil, but don't plant too deeply in the soil (keep the crown of the plant at the soil level). For the first several weeks, place the plant outside during the day in a shaded area and bring it in at night. Each day, leave the plant indoors for longer periods of time. During this acclamation process, water the plant well and allow the water to drain. 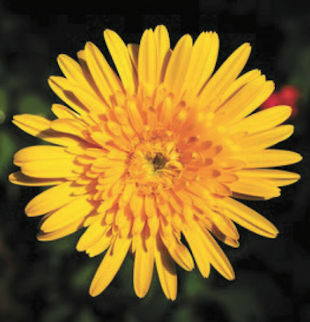 Successfully winterizing Gerber daisies inside requires that you: 1) keep the temperature mild (around 60-70 degrees), 2) provide them full sunlight (you can even supplement with artificial light), 3) water them sparingly whenever the top one inch of soil feels dry (about once per month). Caution - be careful not to over-water and do not fertilize them at all during the winter. When spring approaches, it's time to reverse the process. Put the plant in a shaded area outside during the day and bring it in at night to help it get acclimated to the outdoors and warmer temperatures. Good luck and thank you for your question.